From left, Allentown High School seniors Lorna Drexler and Larissa Cheff, with English teacher Joann Snook and Aspirations Editor Nicole Homer. Hopewell Valley Central High School students with teachers Rebecca Lewart, far left, and Theresa Solomon, far right (next toEditor Nicole Homer). Students from Hightstown High School. MCCC Theatre, Dance, and Music students perform selected pieces. West Windsor, N.J. -- This spring, teens from area high schools experienced just what it feels like to be published authors and artists. 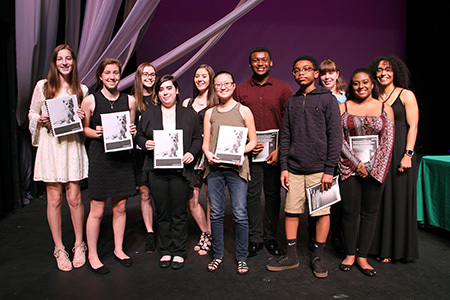 On April 27, the students and their families gathered at Kelsey Theatre to receive their copies of Aspirations, a literary and arts journal published by Mercer County Community College (MCCC) for more than 20 years that features works by high school students. The 2017 edition includes 58 poems, essays and short stories by 52 authors, and 55 drawings and photos by 44 artists. Cover art was a drawing by Stephanie Rosenthal entitled "Jasper." 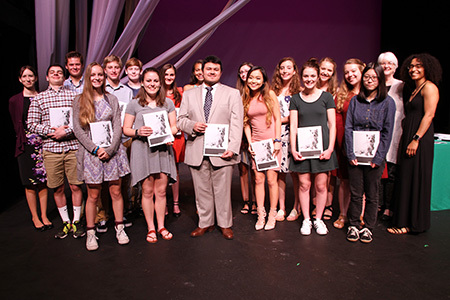 According to English faculty member Nicole Homer, who serves as Aspirations’ editor, the journal is intended to cultivate young people’s creative voices and give them the opportunity to share their work with the community. 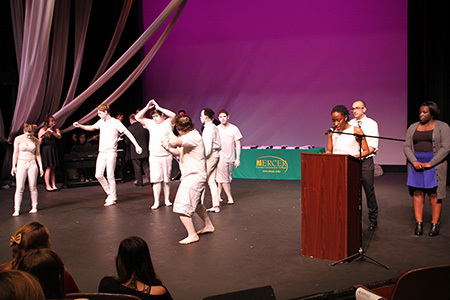 Prior to the presentation of the journals, MCCC students entertained the audience, highlighting the college's arts programs. 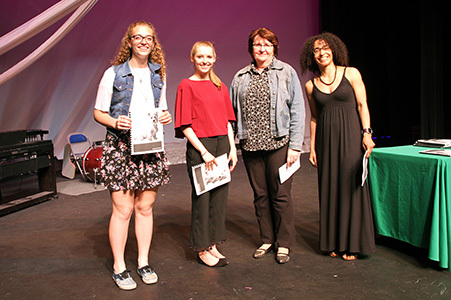 Under the direction of Professor Jody Gazenbeek-Person, Theatre students read selections from Aspirations, while Theatre and Dance students accompanied the readings with interpretative mime routines. Music students directed by faculty member Scott Hornick added their own improvised sounds to complete the performance. In addition to Homer, support came from MCCC faculty members Carol Bork, Daniel D'Arpa, Ric Giantisco, Barbara Hamilton, Tina LaPlaca, Kerri O'Neill and Jacqueline Vogtman, plus high school teachers Ellen Davila (Ewing High School), Theresa Solomon (Hopewell Valley Central High School) and Roman Szolkowski (Hightstown High School). The Aspirations program is funded in part by the Mercer County Cultural and Heritage Commission through funding from the Mercer County Board of Chosen Freeholders, and the New Jersey State Council on the Arts/Department of State (a partner agency of the National Endowment for the Arts).